Alkaline phosphatase, intestinal also known as ALPI is a type of alkaline phosphatase that in humans is encoded by the ALPI gene. There are at least four distinct but related alkaline phosphatases: intestinal, placental, placental-like, and liver/bone/kidney (tissue non-specific). The intestinal alkaline phosphatase gene encodes a digestive brush-border enzyme. This enzyme is a component of the gut mucosal defense system and is thought to function in the detoxification of lipopolysaccharide, and in the prevention of bacterial translocation in the gut. 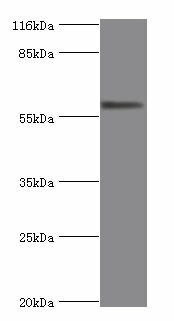 ALPI Polyclonal Antibody. Unconjugated. Raised in: Rabbit.